To find brazil nuts, we must venture deep into the Amazon rainforests of Brazil, Bolivia, Colombia, Venezuela, Ecuador and Peru. This seemingly unexciting little nut is actually the lifeblood of many indigenous communities who rely heavily on their harvest as a main source of income. Tucked far into the heart of the jungle, we discover the giant Brazil Nut trees, towering above the rainforest canopy. These jungle skyscrapers reach an astonishing height of 200 ft and can live to be more than 500 years old! A single tree can produce more than 250 pounds of nuts per year. In comparison, the average almond tree produces a meager 20-30 pounds of nuts annually. The nuts grow inside grapefruit – sized pods. Each pod weighs up to five pounds and contains around two dozen seeds (nuts). Harvesting Brazil nuts is extremely tough work. Villagers must hack open the pods with a machete. Then, they transport the pods – on foot through thick jungle. Thousands of families in the Amazon rely on Brazil nuts for survival, earning over half their yearly income from harvesting these nuts. Just like families of the Amazon depend on these nuts, we depend on these families. Brazil nuts grow in remote wild forests that only local people can navigate. Without the help of the people of the Amazon, we would never be able to enjoy this jungle delicacy. 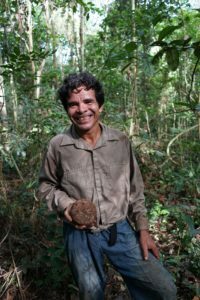 Red River Foods has partnered with the World Wildlife Foundation to support the responsible sourcing of Brazil nuts in the Manuripi Wildlife Reserve and surrounding growing areas of the Pando Region in Bolivia. The project will develop an integrated and comprehensive management system for the Manuripi Reserve focused on the preservation of the environment in the park and developing alternative production programs (agricultural products) for the community. Together with WWF, we are working to implement training programs to educate the communities on the important role Brazil nut trees play in preserving the rainforest. Simultaneously, we are working to develop strong leverage with the Zafreros to create product traceability and quality control programs. All Brazil nuts soured within this program are Organic and Fair Wild certified. In addition, these nuts contain a price premium which is equally split between WWF Bolivia to support conservation work and community development programs to improve the livelihoods of the people collecting the Brazil Nuts.